New ground-breaking technology is helping to tell the real-time story of Scotland's satellite-tagged red kites without any human input. Data from the tagged birds are allowing sophisticated computer programmes to write the story of their lives – through daily and weekly blogs of how and why they explore the landscape around them. The Blogging Birds project http://redkite.abdn.ac.uk is part of a collaboration between computer and environmental scientists at the University of Aberdeen and conservationists at the RSPB. Several kites have been fitted with satellite tags that relay the kites' position up to six times a day. This information is enriched with information on weather, habitat and landscape to build a rich picture of the birds' movements and home ranges. 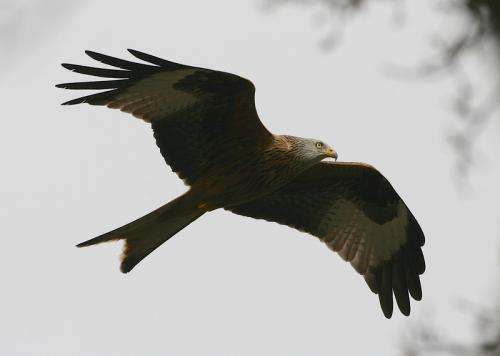 Pioneering programming called "Natural Language Generation" then allows computers to generate written language from this information, in the form of a blog post about the red kite without human help. Whilst humans will always be better than computers at writing blogs that evoke emotions and feelings but computers are able to gather huge amounts of data instantaneously, make connections and incorporate it all into a readable form. Rather than detract from what humans currently do in this field, the computer information can add to it. Although the technology is being used to write blogs about red kites just now (see redkite.abdn.ac.uk) the approach has much wider applications. For example, it allows for the creation of texts of any length and complexity based on gathering data from a wide range of sources, with applications throughout society and business. Dr René van der Wal from the University of Aberdeen's dot.rural Digital Economy Hub and the School of Biological Sciences explained: "Using cutting edge computing technology, red kites will tell you a story about their day-to-day lives – without any help from humans! Keep coming back and you'll see new stories every day and every week about the lives of our red kites as they gradually make their come back into the Highlands of Scotland. We hope many people will visit and give feedback about the Blogging Birds Site (http://redkite.abdn.ac.uk)." Red kites became extinct in England and Scotland due to persecution, with less than 10 pairs remaining in Wales in the 1940s. At the end of the 20th Century, conservation efforts spearheaded by the RSPB resulted in the successful reintroduction of red kites to many sites around the UK. Deemed one of nature conservation's greatest success stories people are enjoying watching this incredible bird of prey flourish in the UK's skies once again. Stuart Benn from RSPB North Scotland said: "It's been really fascinating working on this project. We know that people are becoming more disconnected from nature and we're trying really hard to turn that around. We have to look at all ways of bringing people and nature back together and digital technology is an increasingly important means of doing that as it is the way that so much of the world operates. This project breaks new ground for both bird and computer fans!" A public event which will explain the technology behind the project takes place as part of TechFest at the University's Fraser Noble building on September 24, 8pm.